Studies show that kids who are well mannered are more confident and successful and have better relationships. What parent doesn't crave that for their child? 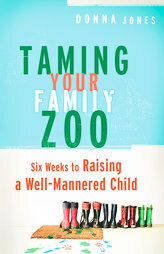 In Taming Your Family Zoo, Donna Jones shows parents, teachers, and child-care providers how to raise well-mannered children and promises results in less than six weeks. From training a two-year-old to say "please" to the more knotty issue of talking with a teenage boy about his treatment of girls, Jones unfolds step-by-step techniques for teaching manners. Jones also teaches parents how to instill a love for God and for others, and encourages them to grab hold of every teachable moment they can to show their children something they can use the rest of their lives. Taming Your Family Zoo is thoughtful, engaging, humorous, and filled with the importance of communicating love when teaching children. It seems sometimes it's almost a lost concept in today's world. She really does cover everything from, table manners to how to answer the phone. Personally, I wish everyone, with or without children, would read this book.